You are welcome to use theses simple drawings of Christmas to help you create some crafty festive magic around your home and for your friends. There is nothing like the personal touch to give loved ones the feeling that they are special. 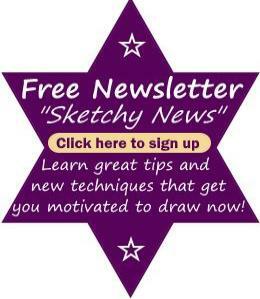 Have you tried drawing yet? The simple illustrations here are very basic and I would love it if you try to copy them. The only tools you need are a 2B pencil, a sharpener, an eraser and any kind of paper. You will succeed if you always have a positive attitude as well as a great desire to draw. There are different ways to approach art and we each have to discover the method that suits us the most. I varied the way I created every image because it usually depends on the topic I was attempting to copy. Of course, there are numeous drawing tools available to us and it is quite good fun to experiment and find what suits you the best. For my Christmas Angel drawing, I didn't trust that I would get the proportions correct so I first drew the angel using a grid. Then I immediately drew her again, in a smaller size, only this time without the aid of the grid. You gain confidence when you use a grid, it is a subtle way of showing you how to achieve a good imitation. It's an amazing tool to help your progress. I used my ruler to measure the size of the angel's head and then I roughly estimated that it fit approximately 8 times into the length of the body. That is just a general guideline to use when depicting the human form. If you like to create angel drawings or sketches, you can start by placing a rectangle on your paper to give a good guideline of height and width. 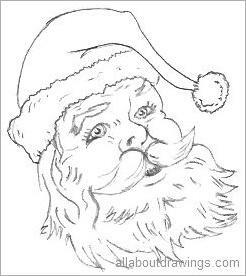 I do all of my drawings of Christmas lightly at first and I add extra lines to correct the shape of the form. Once you are confident with the correct lines, make them darker so you can easily spot the incorrect lighter ones. When you are satisfied that the outline is to your liking, go ahead and erase any incorrect lines. It doesn't matter if you happen to erase parts of the darker lines, just go over them again. TIP: If you don't have a kneadable eraser you can cut an ordinary eraser to give it a fine edge and that makes it easier to get at difficult spots. Another method which is of great help to beginner artists is to place a border around the portion of a picture that you want to copy. Then you draw the same size border on your paper. 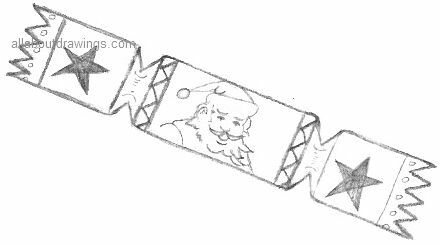 To achieve a good outline, study and copy your drawings of Christmas by watching where the lines deviate next to the border you have drawn. This is very much like using negative space. It's a handy way to double check that your outline is a good match to the original. 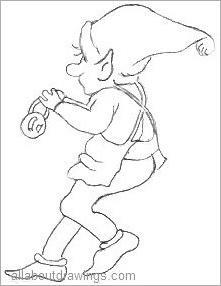 A border helped me to get a good likeness when I did this elf drawing. It's particularly helpful if the border is touching as much of the subject as possible and that makes it easier to copy. If you want to smooth over hard lines, you'll need a blending stump which is a handy tool for all artists. 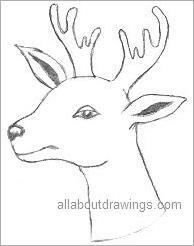 My next subject for creating drawings of Christmas was a simple reindeer which I thought was a good choice. I drew this one by just looking, judging and copying and it is as easy as it looks. This is where my hobby gives me the greatest pleasure, to sit and draw and admire. I know I'm not the best but I only need to draw for me. You will enjoy drawing a lot more if you don't put pressure on yourself by trying to live up to anyone's expectations. 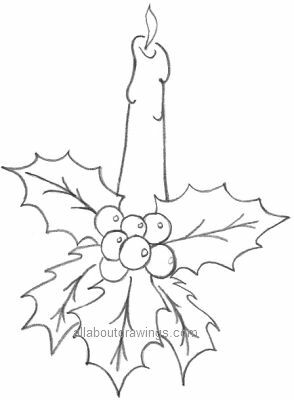 By now, you should be seeing that these simple drawings of Christmas are quite achievable for you. You will only know if you try! You don't have to show anyone your artwork so you have nothing to lose. Another method you can use to assist you is to visualize what common shapes you can see in your chosen subject. 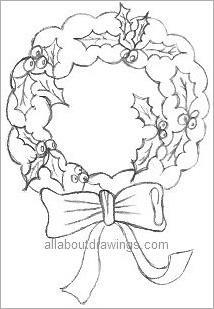 When I drew the Xmas wreath, I started by lightly outlining one circle inside the other. I went over the circles with the scalloped pattern, matching the inside with the outside. I can see I have made the top of the wreath larger than the bottom but I'm going to pretend it's alright. I felt the simple design was perfect for a beginner artist like me so you should be able to imitate these drawings of Christmas, too. There are so many pencils to choose from when you start to draw and it can be very confusing. The best pencil for you to use is a soft pencil, like a 2B. All B pencils are soft. A 2B is a lighter soft pencil and a 9B is a very dark, soft pencil. I drew this bonbon freehand and then I went over my lines with a ruler. I was pleased that my original freehand lines weren't too bad. It's good practice to draw lines freehand as much as you can. Here is the link to my first page of Christmas drawings that I did about 2 or 3 years ago. In 2014, I enjoyed creating more festive drawing pictures. I am an impatient drawer, I can't wait to see what I can achieve just by copying a picture straight onto my paper. Sometimes it has disasterous results and other times I think I have done a good job and I am satisfied. When I struggle getting a good likeness, I realize I need assistance so I generally use one of the methods I described here - they are the ones I rely on the most. Drawings of Christmas wouldn't be the same if I didn't include a candle with holly. I did the candle freehand which means it was just copied with no guidelines in place. I think the candle could have been larger, to suit the size of the holly but I only realize this in hindsight. When you check illustrations the next day, it is a surprise how many errors you spot that were not evident whilst you were involved in the drawing. It's a good idea to keep your old cards in a folder so you can create your own drawings of Christmas in the future. Once you copy from a card, don't throw it away because it can be used in a collage -- paste all the pictures over a gift box for a special and effective touch. I hope you enjoy these drawings of Christmas and don't forget to use them to make your own greeting cards.